Every so-called entrepreneurship guru out there will tell you that you need to grow your business – and keep on growing it – but in my experience the reality is that most businesses that grow without adequate preparation, end up being a sad statistic. Am I growing as a function of my ego or is there a real, profitable growth opportunity that has presented itself? If you are satisfied that growth is a route that you want to take, then there are six things that I implore you to build out before starting the growth journey. It is extremely important that your growing business has the requisite processes in place to support its growth. Start off by documenting all replicable processes, and ensure that your current – and future – staff are trained on these processes. As your business grows, so too will more and more of its processes which you will need to delegate to other less experienced staff. What are the controls that you would need to put in place in order to ensure that these processes are being followed accurately? For example, is your marketing department spending in accordance with the agreed-upon budget? Is the teller scanning every item through the checkout? Without the appropriate controls in place, I have witnessed many businesses that were growing descending into chaos and haemorrhaging cash, efficiency and staff. I feel strongly that small businesses should focus more on using their limited marketing spend on direct sales and call-to-action activities. 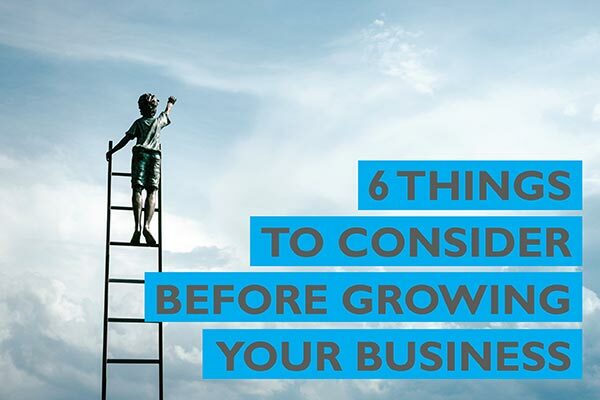 However, as your business grows so too does the need to build its brand because that supports client acquisition, client retention, staff acquisition, staff retention and much, much more. Brand building is a slow, methodical and deliberate process. Growing businesses attract a growing number of competitors. In my experience, very few small businesses have a REAL unique selling proposition (USP) that translates further than a small geography or element of the market. The entrepreneurs with growth mind-sets need to spend a disproportionate amount of time honing, evolving and innovating the USPs of their businesses. As your business grows so too will the need for management. The first source of managers that small businesses generally tap into is the incumbent staff. This is mainly due to loyalty, and the fact that these existing staff have experience in the ways of the business. However, very often, these individuals do not have the requisite managerial experience to handle the growth of the business. It is therefore imperative that you have a dual approach to building your management capacity. The first approach is to build management skills within those incumbent staff that have the potential to grow, and the second approach is to bring in new, external management skills. Having said this, I now look for leadership skills over management skills when building my management capacity. My experience is that people with leadership skills have far better success in a growing business, than those with management skills. Growth requires capital and, if the growth rate of your business exceeds the capital generated by profits, then financing options are a non-negotiable. Don’t wait until the last minute to find these financing options. Identify potential sources of finance at the point at which you make the decision to grow. Increase your overdraft facilities in good times, build relationships with your bank manager in the good times, and deliberately try and discover financiers such as venture capitalists, angel funders, and the like within your personal and business networks. When the day arrives that you’ll require that finance, you will not be panicked, desperate or surprised and, as a consequence of this pre-planning, will choose the best and cheapest finance option for your growth. Business growth is not possible without people, processes and capital, and all three have to be pre-planned, nurtured and applied in accordance with the rate of growth of your business. Do not fall victim – like so many businesses I have seen – to the consequences of unplanned growth. Rather prepare now, and become one of the shining entrepreneurial success stories that small businesses read about and look up to.